I confess. I have a scale addiction. I have only weighed myself every single morning for as long as I can remember. When I'm on vacation I can't, except that one time I found a scale under the sink at the Bellagio in Las Vegas of all places. So when I was contacted about receiving a Beets BLU Bluetooth smart scale in exchange for review, my answer was YES. Does this fit my brand or does it fit my brand? Not that we don't already have two scales at home or anything. We each came into the relationship with our own scale. Mine weighs in half pound increments, but his weighs in increments of .2 so mine was relegated to the extra bathroom. The Beets BLU Bluetooth Scale does that and a whole lot more. It measures weight, body fat, muscle mass, water level and bone density percentages. It also tells you how much of your weight is lean body mass and calculates your BMI. Like everything else, there's an app for that. I think it will be good for me to have another number besides weight to track progress. There is much debate over how accurate these things are, but considering the best and truest way to measure body fat is a DEXA machine or underwater weighing that most people don't have access to I think it can be a helpful tool to establish a baseline if nothing else. My understand is that a harmless electric current passes through your body to measure resistance. The greater resistance the greater body fat. The next best thing after this, is body fat calipers. That being said, based on past testing I do think the number I'm getting is fairly accurate. I'm finding that the Smart Scale app needs to be open in order for all the information to transmit. Once you step on the scale, there is one beep to indicate that weight has been recorded and a second beep to indicate the rest. The weight comes up faster than any scale I've ever stepped on. No hesitation at all. Anyone can step on it at any time for weight. It shows up on the scale, but the app is required to obtain the rest of the information. I am secretive about my weight, so I make sure the phone is on vibrate because the app recites all of your stats out loud. It's especially fun when you don't like what you hear. The app graphs changes daily, weekly and over a 30 day period and is very easy to download and navigate. Multiple users can download the app and have individualized information sent to their app. I like it. We both do. He likes almost anything with Bluetooth and I like that it's sleek and nice to look at. So now I have this cool little syncing circle going on. My weight records where I want it to without me having to do anything. I use Lose it! to track calories and weight. The scale does not sync with Lose it! but it does sync with the Health App on my iPhone which syncs with just about everything. The Smart Scale app sends my stats to the Health App which sends it to Lose it! Simple. Now if only getting and staying in shape were as easy as that. I am not one of those "I just go by the way my clothes fit," people but I am thinking I may do an experiment where I weight in daily as usual, but don't look at the information for at least a week. It would probably be really good for me to see what it's like not to be aware of that number day to day. I do not necessarily advocate daily weigh-ins. I know there are other ways to track progress, but I think having an accurate scale is helpful if you are working on weight loss goals. The extra information the scale provides is a bonus. It sure can creep up on you the older you get, and even if you aren't trying to loose weight it's a good way to make sure that you are staying on track. 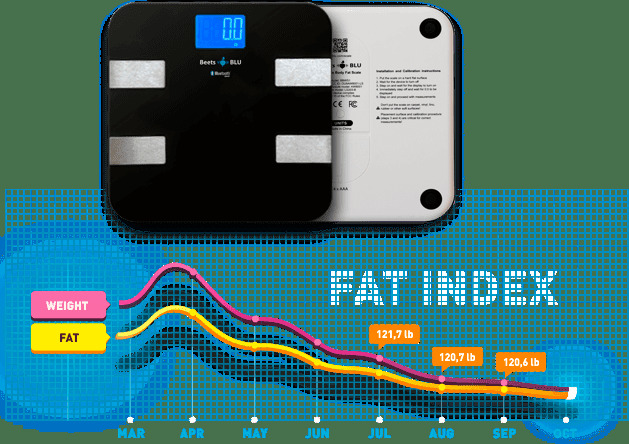 If you are in the market for a scale that measures body fat this is a good one. I weigh myself everyday too! Vacation time kills me when I don't have a scale. Thank you for admitting it out loud. I have yet to tell anyone that I weigh myself everyday. Only my husband knows because he hears the beep of my scale every morning.